It has probably been a long time since you last took a civics class. 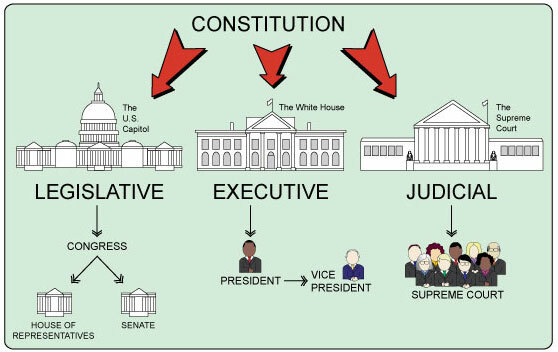 Here is a quick rundown of how the federal government is organized. Here in the United States of America, the federal government is divided into three major branches. This is done to create a system of checks and balances. Each of the three branches holds specific powers that the other two do not. This allows each branch to “check” the powers of the other branches to ensure that they do not gain too much power. Today we will take a brief look at the three major branches of government. The Executive Branch is probably the most well-known and iconic of the three major branches. The power of the Executive branch is bestowed in the President of the United States. Other members of the Executive branch include the Vice President and the members of the Presidential Cabinet. Members of the Cabinet are nominated by the President and are approved by the Senate. The executive branch is responsible for carrying out the laws. You are probably familiar with Legislative Branch’s more common name, Congress. The Constitution gives Congress the authority to enact legislation and to declare war. Congress is subdivided into two major groups, the Senate, and the House of Representatives. The Senate consists of 100 members, two from each state. The House of Representatives has 435 elected members. Each state is granted a specific number of representatives based on population. More populous states are granted more representatives. Each Senator serves a 6-year term, while each Representative serves a 2-year term. The final branch of government, and the most familiar to Van Norman Law, is the Judicial Branch. The Supreme Court of the United States leads the Judicial Branch. It is the job of the Judicial Branch to uphold the Constitution by evaluating the laws. The Judicial Branch presides over court cases, protects the judicial process, and oversees the laws of the land.